"Ferolito, Vultaggio, & Sons (AriZona Beverages) was founded in 1971 by Don Vultaggio and John Ferolito and to this day remains a privately held and family-run American business. 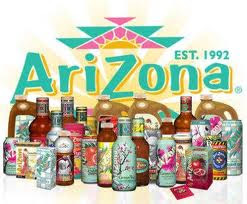 AriZona Beverage Company-makers of AriZona Iced Tea, flavored waters, juices, coffees, energy drinks and powdered tea mixes-is the leader in hot-filled beverages for the United States. AriZona’s mission is to create great looking products of the highest quality that people will like and can afford to buy. For more information, visit http://www.drinkarizona.com/." "Each kid-friendly bottle features a soccer ball, a basketball, or a baseball shape incorporated into the design to encourage children to smile. Like other AriZona beverages, this lemon-flavored iced tea contains no preservatives, artificial colors, or artificial flavors and uses pure cane sugar as a sweetener. Additionally, each bottle of this new product contains 100% of the suggested daily intake of Vitamin C and only 60 calories per serving." What we thought: The kiddos really enjoyed these:) In fact, they practically inhaled them! I would sneak a drink each time I opened one of their bottles and I must say, they were pretty tasty:) I am a huge tea drinker, but one of the reasons I drink tea is for the caffeine which I don't like for the kids to have, so generally they don't get a lot of tea unless it isn't caffeinated. AriZona hit the ball out of the park with their caffeine-free teas that are perfect for my little ones. Now they can enjoy tea more often:) They were also big fans of the Arnold Palmer half tea half lemonade drinks. They loved the kid-friendly sports-themed bottles:) Great job AriZona! You have made some new fans for life:) ABCD Diaries gives AriZona an A+! Buy It: Find these yummy kid-friendly teas at grocers and mass merchandisers nationwide. Win It: AriZona has generously offered one ABCD Diaries reader 1 case (half lemon tea, half Arnold Palmer)! To enter, follow our blog via GFC and comment below. Giveaway ends Saturday, April 16, 2011 at 11:59cst. Winner will be chosen via random.org and emailed. They will have 48 hours to reply. Open to US residents 18+:) No PO Boxes. Disclosure: ABCD Diaries was given teas for review purposes only. We were in no other way compensated. The opinions expressed in this post are ours and ours alone. I entered New Standard giveaway. This is TOTALLY the giveaway for me...I am hopelessly hooked on Arizona Iced Tea! Like AriZona on Facebook as Jennifer H.
I follow as Renee G and would love to win this for my boys. Entered the Pink Princess Giveaway. I like Arizona on facebook. I'm a GFC follower. Thanks. I follow AriZona on twitter. Would love to win this. We love the Arnold Palmer here, but are always leary about giving some to our daughter. So this is perfect for her! I follow. These look cool.